Earlier in the day defrost the firm tofu and give a bit of a squeeze over the sink when fully defrosted to remove excess water and then crumble. Set a pot of water to boil for the pasta. When the water is boiling place the pasta in the water and cook to the instructions on the packet. Meanwhile set a large fry pan on a medium heat. Add a decent slosh of olive oil. When hot add the crumbled Earth Source Foods tofu and fry until lightly browned. Add in the grated carrot, beetroot, onion and garlic. Fry while stirring for a few minutes then add the basil, oregano, stock and pepper. Cook a few more minutes to mix the flavours through. Finally add the jar of passata and mix through. Allow to bubble and thicken while stirring occasionally for approximately 5 to 10 minutes. Drain the pasta when al dente. 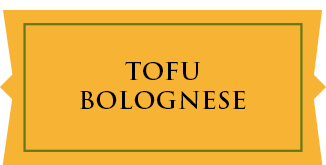 Serve with a generous heap of delicious bolognese sauce top with vegan cheese if desired.